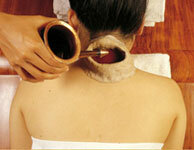 Abyanga is Ayurveda’s principal healing tool and the mother of all massages. It is a whole body massage given with herbal oils customized to your body type to detoxify, nourish and revitalize the body tissues (Dhatus). 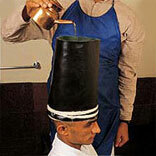 Abhyanga has much deeper and more far reaching effects than ordinary massage using mineral oils and lotions. Abhyanga achieves deepest healing effects by naturally harmonizing Mind Body & Spirit. This massage is usually given by two therapists for one hour and is usually followed by a herbal bath or medicated steam bath (Sweda). 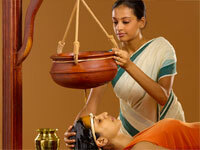 It is one of the most rejuvenating treatments of Ayurveda. Increases tissue strength, Improves blood circulation, Rejuvenates the whole body, Removes cellulite, beautifies the skin, Anti aging, helps sleep better, promotes vitality, Reduces Vata imbalance, stress and toxins. Anxiety, Depression, Epilepsy, Hypertension, Diabetic Neuropathy, Central Nervous System, Hemiplegia Paraplegia, Strengthens the sensory organs, Insomnia, Pre-mature graying of the hair & hair loss Mental retardation, Paralysis, Stress. Insomnia, Brings sound sleep, Cooling to the eyes, Headache, Removes dandruff, Pre-mature graying & hair loss, Profoundly soothing and relaxing. A very stimulating massage of the lower legs and the feet for 30 minutes to activate the acupressure points. Improves the eyes, Soothing and cooling to the eyes, Alleviates burning of the eyes, Induces deep sleep, Improves luster of the skin, Smoothens cracked skin of the feet, Hyper tension, Relieves tiredness of the feet. Anxiety, Facial paralysis, Insomnia, Neurological disorders, Psychological disorders, Skin disorders such as Eczema & Psoriasis, Stress. Relieves the strain due to constant glaring to the Computer & TV screen, Refractive errors of the eyes, Chronic Conjunctivitis Corneal Ulcer, Dry Eye Syndrome, Eye diseases due to aggravation of Vata and Pitta toxins, Glaucoma Helps in preventing early formation of Cataract, Improper co-ordination and loss of movement of the eye balls, Pain and burning sensation in the eyes. 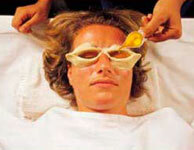 A soothing technique to relax strained eyes, Cooling and refreshing, Delays cataract formation Helps in treating chronic Conjunctivitis, Improves eye sight, Makes the eyes sparkle. Reduces pain in the body, Eliminates toxins, Promotes lightness, Reduces stiffness, Beautifies the skin, Removes the Cellulite. Paralytic strokes, Anti-aging & rejuvenating, Strengthens tissues, Body ache, Emaciation, Debility Monoplegia, Osteo Arthritis, Rheumatoid Arthritis. Headache, Depression, Hyper active conditions, Burning sensation in the eyes, Insomnia, Skin disorders. Facial palsy, Headache, Insomnia, Improves memory, Dermatitis of the scalp, Dandruff, Other neurological disorders Paralysis, Skin disorders such as Eczema. Chronic back pain, Loss of function of a part or whole limb, Joint stiffness and swellings, Muscular pain, Anti-aging & rejuvenating Sciatica, Spondylosis, Sprains and cramps. Chronic Fatigue Syndrome (CFS) after exposure to a viral or bacterial infection, Increases Ojus & Body Immunity, Anti-aging & rejuvenating Alleviates the burning sensation in the body, Ensures better circulation, Helps to recover from paralysis, Promotes healing of fractures. This is a specialized herbal treatment for weight reduction. An herbal paste or powder is applied all over the body and deeply massaged with specific movements by two therapists for one hour. Toning the skin & muscle after child birth or weight loss, Removes Cellulite, Obesity, Weight reduction, Imparts good complexion to the skin Revitalizes the sense of touch, Removes Kapha toxins from the body. Rheumatoid Arthritis, Osteo Arthritis, Varicose Veins, Improves circulation, Improves skin complexion Relieves body pain. This is a very unique whole body massage using feet instead of hands. It is performed by two therapists for one hour. Removes deep seated pain in the joints and bones, Deeply relaxing, Helps in removing toxins from deeper tissues, Removes excess of fat. Insomnia, Gives cooling effect to the head, Burning sensation of the scalp, Improves eye sight, Skin disorders, Relieves headache. Strengthening of the heart, Relieves deep seated anger and sadness, Cardio Myopathy. Pain of knee joint, Osteo Arthritis of the knee joint. Cervical Spondylosis, Chronic pain in the neck region, Compression fractures. Chronic and acute backaches, Prolapsed disc, Lumbar Spondylosis, Osteoporosis and Sciatica.